Good Luck Soup is a transmedia documentary project on the journey of Japanese Americans and Japanese Canadians, from past to present. Created by Matthew Hashiguchi, an award-winning documentary filmmaker and Assistant Professor in Multimedia Film & Production at Georgia Southern University, the interactive documentary weaves together individual stories from different generations in a series of seven chapters that, when viewed together, reflect the universal themes of immigration, integration and identity. Following his ‘Show & Tell’ presentation at i-Docs 2016, I caught up with Matthew to find out more about the project and his thoughtful approach to making interactive documentary. Can you tell me a bit about yourself? How did you get into making an interactive documentary? I started out as a photojournalist working for newspapers. When I began my journalism career the news industry was transitioning heavily towards the Internet. So, utilising the web as a way to distribute, aggregate and tell stories was something that I was introduced to early on in my career. Over the last few years, I’d been increasingly exposed to interactive documentaries through friends, colleagues and fellow filmmakers and I wanted to try the interactive/web-documentary approach. But, it was important that the story match the medium… I didn’t want to make an interactive documentary for the sake of making one. It needed to fit the web and interactive format. While I was filming my feature documentary, Good Luck Soup, I kept coming across other stories and experiences that didn’t fit within the single narrative of the film, but fit nicely within the interactive documentary realm, so I expanded the Good Luck Soup project to include both a feature film and an interactive documentary. You went to Kickstarter to fund the film – what were your experiences? Is it something you’d do again? This was the second time I’d used Kickstarter to fund a film. The first time was for my thesis film, The Lower 9. Unfortunately, I don’t think using Kickstarter is an option for me anymore. I feel like two is the maximum amount of campaigns that I can personally run. This is a transmedia project, with the interactive launched before the linear film – was that your original plan? What made you chose that workflow? The linear film was completely shot before the interactive doc came about. While I was editing the linear film, I had all this additional, yet strong, content that didn’t fit within the linear film’s story. These were stories from other Japanese Americans who were incarcerated in the US during World War II and they were discussing things that had never really been addressed… things like what happened after the Japanese American Internment Camps closed. I wanted to further tell this story and expose these perspectives beyond the film and a web-based, interactive documentary was the best outlet for this content. I never sought to create an interactive documentary. My goal was to tell a story and for some of the content, a web-based project was the best approach. For the other content, a traditional film was the best approach. I’ve been hearing a number of people tell me that they want to create an interactive documentary, and I don’t know if it’s because it fits their idea or if they just want to make an interactive project. It’s great to experiment, but it’s more important to do what’s best for the story. There’s a participatory element to the i-doc – what made you want to add this and have you had many contributions? 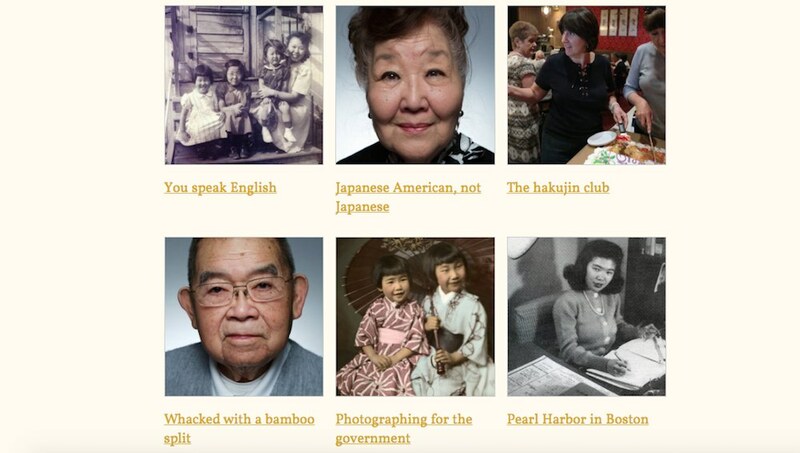 We wanted to give a voice to the Japanese American community. 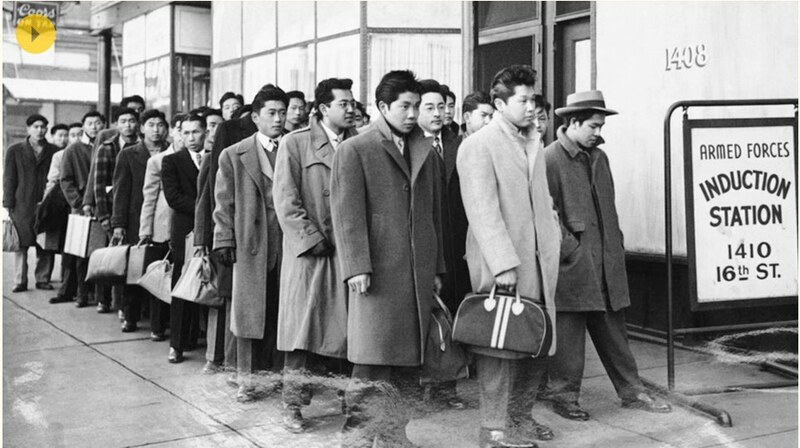 The Japanese American, and the Asian American community in general, is often overlooked within American society. 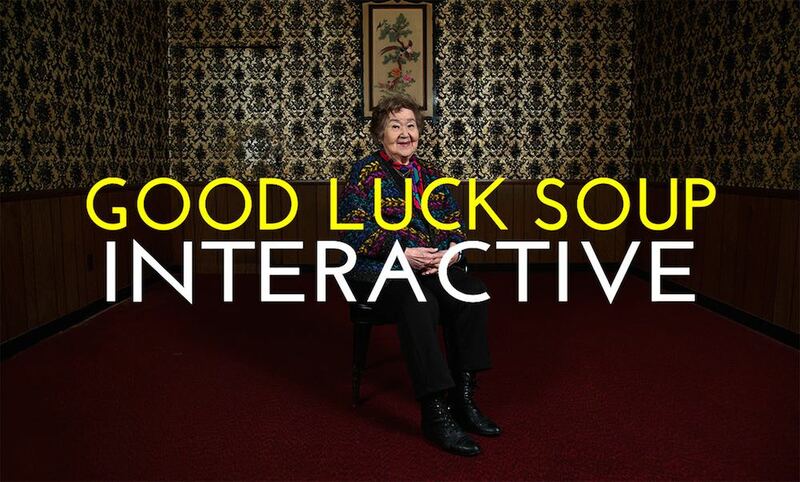 Good Luck Soup Interactive is about giving voice to those 120,000 Japanese Americans who were unjustly incarcerated because of their ethnicity and race nearly 75 years ago. They did not have an outlet to speak through and we wanted to give those people, or their relatives, an opportunity to share their stories. While the project is not reliant upon story contributions, many of the stories within the web-doc were uploaded or shared with us. I think about 1/3 of the stories within Good Luck Soup Interactive were from community contributions. The rest were documented and logged by our team through “community storytelling sessions” that we had in Boston, MA, and Cleveland, OH. Crowdsourcing stories is a lot like crowdsourcing funds… you have to work for contributions and that takes a lot of time. Initially, I was much more active in seeking out individuals to contribute, but since our initial launch I haven’t been as active. I’m also pretty happy with the stories that we currently have in place. They’re of high quality and quality is much more important than quantity. You’re planning to do a short version in VR – what made you want to do that? How are you planning to translate the experience into a 360 world? The Good Luck Soup film and i-doc often discuss celebrations that still exist within Japanese American culture. I think VR is strongest when it emphasises environment and using the technology appealed to me because it allowed me to take viewers into the kitchen of a 90-year-old Japanese American grandmother as she cooks and prepares for her annual Japanese New Year’s Day celebration, which she’s been observing her entire life. In many cultures, a grandmother’s kitchen is an almost sacred space, and VR allowed me to take people into that space without the risk of being kicked out of the kitchen. You presented at i-Docs 2016 – do you have any key takeaways from the conference? I really enjoyed the conversations revolving around VR technology and its potential. It seems it’s being touted as the future of storytelling, but I’m not quite sure it’s capable of being THE future of storytelling. Just like i-docs, it’s probably going to be part of the future, but I don’t see it replacing what’s already in place as the mainstream and most profitable storytelling experience. When having these conversations I think it’s important that we look at its limitations, in addition to its potential. Being critical of the medium will force it to improve. VR is like a promising film student… if their teacher only told them that they’re great and perfect, rather than pointing out their flaws and limitations, they would never improve or refine their craft. After you’ve finished the linear and VR portions of the project is that it wrapped? Do you have plans to make any other i-docs in the future? I still have a good amount of work left with Good Luck Soup. Over the next few months I’ll be editing the film down to a broadcast hour for the Center for Asian American Media and the Corporation for Public Broadcasting, while also working on the VR piece. After that’s complete, I have another short documentary that I’m working on, which is about immigrant children in the US and their roles as translators for their non-English speaking parents. This project was originally intended as a VR doc, but recently changed it to a traditional, linear short film. I’d like to continue working with VR projects, but it will have to be the right project. Down the road I’d also like to work on more i-docs, but don’t have any current projects in the pipeline. Those projects require a great amount of time and money and those are two things I have very limited access to. Good Luck soup interactive can be experienced online here. You can find out more about Matthew here. The linear documentary has been screened at a number of festivals and will be broadcast in the US in the near future.